Context As A Content Strategy: Let’s Hash It Out! For the first time in my professional career, I took a pretty big leap. I told a room full of very, very smart user experience professionals at Internet User Experience 2010 that I believe content strategists are not doing enough to adequately prepare for the next big thing. I also mentioned that I believe that Context, not content, is the real king when it comes to the web. I’m happy to report that my thoughts and early stab at setting up the foundation for Context Strategy were both well received (see slides below). Still, I’d like to reiterate that this process still needs refining and that we need to start finding better ways to account for personal behaviors (personal behavioral context) and personal situations (personal situational context) in order to take content strategy to the next level. 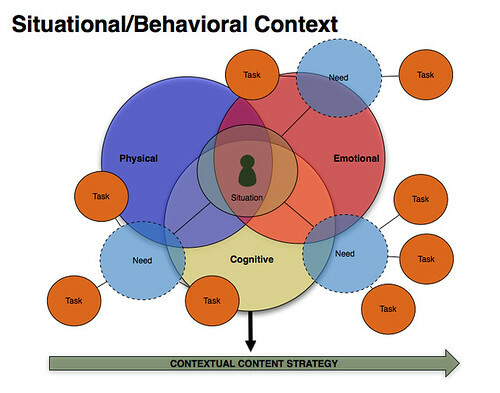 When we combine personal behavioral and personal situational contexts we have the basis for what we’d potentially need to create a contextual based content strategy. View more presentations from Daniel Eizans. My next steps are to start exploring fields for content audits and persona development to begin accounting for context, while researching tools (including Eye Tracking, Functional MRI and biometric data) that can be synthesized on a project by project basis. Like I say in my presentation, I really need help formulating this discussion to get to a place where we can all start creating more meaningful content for users on the Web. Comments on my presentation or the idea of Contextual Content Strategy in general are more than welcome. Let’s hash this thing out people! Very insightful, very palatable. This makes good sense even to an industry outsider. Outside of the box thinking has always been your forte…glad you’re making others see the view that you see from your mind’s window. They will be better off for it.